I bought this vegetable at Wal-Mart for .99 cents about 5 months ago when it was very tiny. In the Philippines it is called pechay but here in the US, it is commonly named as "bok choi", "pak-choi", and "bak-choi". It is classified as a cabbage. This vegetable was originated in China before the 15th century and one of the most popular vegetable in the Philippines. 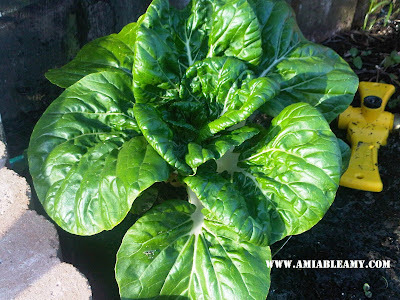 Bok choi contains high amount of Vitamin A and Vitamin C.